OBee Community Interest Company is delighted that Gemma Sayers has agreed to be our new Heritage Building Director. With a wealth of Natural and Traditional Building experience and skills behind her Orchard Barn looks forward to working with her. 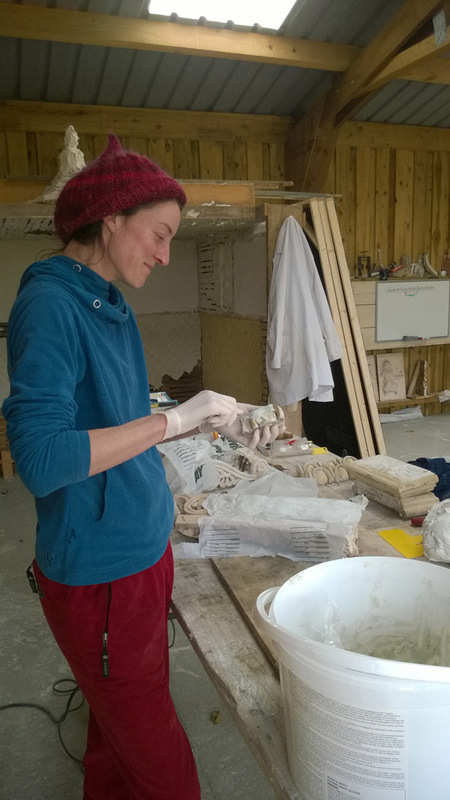 Gemma Sayers is a lime and earth plasterer with seven years experience in natural construction. She first picked up a hawk and trowel in 2012; to renovate Victorian buildings for her housing cooperative in Ipswich. During this project she made first contact with Orchard Barn, popping up there intermittently ever since. Hungry for eco-building, she embarked on a pan-European journey volunteering on construction sites, learning vernacular and innovative methods. In between she attended a wide variety of heritage and eco-building courses; including one in Italy with Sarah Partridge of O Bee CIC. As her skills increased she took on paid building work, and to lead workshops in clay and lime. On returning to the UK she did the Prince's Foundation Building Craft Apprenticeship, and won a bursary from the National Heritage Training Group, for training placements. These organisations enabled Gemma to achieve the Heritage NVQ level 3 in Solid Plastering. "My vision is to empower people to repair and build their own homes using natural materials; reducing the burden of non-recyclable, non-biodegradable materials ailing this planet. We need to change the perceived stereotype and the approach of the construction and conservation industries in order to facilitate new people getting involved who would not traditionally, eg women, and those who seem no longer interested, eg apprenticeship-age teenagers and young people. There are few in depth training opportunities available to access the heritage sector; apprenticeships having died out and construction colleges focussing on 'waterproof' materials, which only damage historic buildings. In contrast there are many people interested in building with ecologically sound; breathable materials, using time-tested methods. These people need to know the fundamental principles of natural, traditional building, which are often confused or just not communicated. What I love about Orchard Barn is that this essence permeates everything; is transmitted with every choice & action."